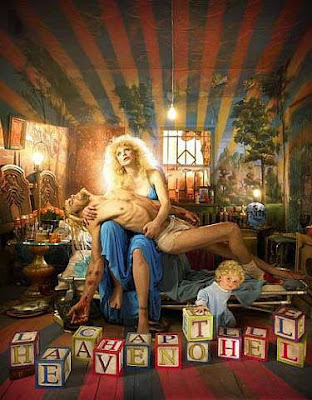 David Lachapelle's work is so clearly articulated through images that words are unnecessary to explain his point of view. While in Paris last month, I had the wonderful experience of visiting the largest exhibit Paris has put on for the iconic fashion photographer. Unique and ironic, David Lachapelle pushes the envelope in his photography often using religious motifs in art history, with a particular interest in the Renaissance. He exploits the persona of pop culture icons recognizing that image does not necessarily correspond to reality. He got his start along side of Andy Warhol and it is no wonder that he is a genius at giving us a clear reflection of our society. Lachapelle will relate religious scenes from the past that are relevant today and searches for contemporary references to correlate our place in time. He photographs the influence of pop culture often portraying a decadent scene that is about to be washed away by a great storm or explode into emptiness where we can start over and rebuild. Society's celebrity fascination, superficial logo aspirations, media driven culture appears unsustainable when seen through the eyes of Lachapelle. In order to be a leader today, one must attain fame. In order to to attain fame one must distinguish themselves from the masses and there are no societal boundaries today where scandal and gossip have created highly influential individuals. 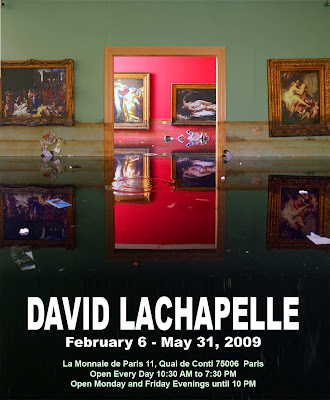 In a land where wearing brand name logos is how we define ourselves, celebrities are our gods, and retail space is our temple, it will be interesting to see what David Lachapelle has in store for 2009 amidst our financial crisis and the dramatic changes we are witnessing. Is it a time to rebuild?